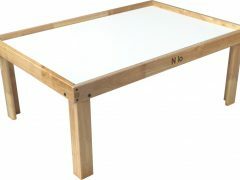 Nilo® Multi-Activity Childrens Play Table (measures 32″ x 48″ play area, 19″ to top of white table top. Nilo® Lego Table, Train Table, Multi-Activity Table Review. Star Reviews on our website. © 2019 Nilo Toys - All Rights Reserved. Designed by Jewel Web & Design.